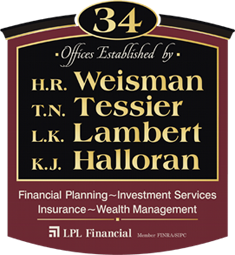 We are an experienced, comprehensive financial services firm in the Nashua NH area. Our associates are registered to recommend mutual funds, individual stocks and bonds through LPL Financial and are licensed in the areas of life and health insurance and annuities. We pride ourselves on offering access to appropriate products and believe our excellent client service makes us unique. We take the time to learn about each individual’s financial situation and goals before we make any recommendations and we can present a customized, clear analysis and options. We offer to coordinate with our clients other advisors such as attorneys and accountants. Our strategy is to provide quality advice, solutions, information, products and services to clients to assist them in the accumulation, protection, preservation and transfer of their assets. To provide comprehensive plans to help clients achieve short and long term financial and estate plan objectives.